The public is invited to a free, family-friendly afternoon to celebrate the 25th anniversary of the opening of Riverside, the Farnsley-Moremen Landing on Sunday, October 21 from 1-5 p.m. 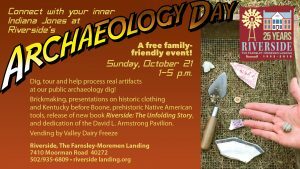 The event will feature opportunities to engage with Riverside’s history and with its long-standing public archaeology programming. Visitors can connect with their “inner Indiana Jones” through a public archaeology dig, an artifact identification and processing activity, demonstrations of prehistoric Native American tools, a brickmaking activity, tours of archaeology sites and special historic house tours. There will also be a presentation on historic clothing (and its connection to archaeology) at 1:30 p.m. by Brian Cushing (Historic Locust Grove) and a presentation on “Kentucky Before Boone” by Gwynn Henderson (Kentucky Archaeological Survey) at 3:00 p.m.
A new book about the site, entitled Riverside: The Unfolding Story, written by Historic Site Manager Patti Linn will also be available at the event. This 25th anniversary publication published by Butler Books retails for $30 and features the latest research on Riverside. It also brings its story into the 21st century. All proceeds from the sale of this full color, 8 x 10 inch, 160-page hardcover book benefit Riverside, the Farnsley-Moremen Landing and its educational mission. Finally, at 4:00 p.m. visitors are invited to join the Riverside Management Board and Mayor Fischer for the dedication of the David L. Armstrong pavilion at Riverside. This honor is being given to the late former Louisville Mayor and Jefferson County-Judge Executive because he played such a pivotal role in championing the project to restore the Farnsley-Moremen House and open it to the public. Directions to Riverside, the Farnsley-Moremen Landing from Downtown Louisville: Take I-65 to the Gene Snyder Freeway West. Go approximately 9 miles. Take a left at the stop light onto Lower River Road. The entrance to Riverside will be on your right after about 1/8 of a mile. Historic site is located at 7410 Moorman Road, Louisville KY.